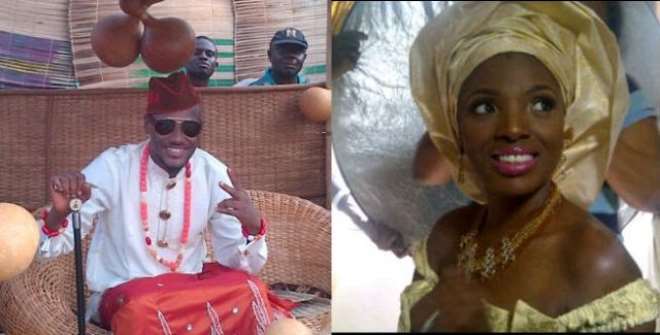 A bit of tradition was meted out on 2Face Idibia on Friday at his traditional wedding with Annie Macaulay at the bride's hometown. In the presence of top politicians like Godswill Akpabio (Akwa Ibom State governor) and Florence Ita Giwa, 2Face was asked to touch his Joystick and make a promise to satisfy their daughter. The Idoma-born singer joyfully did. As Esit Urua custom demands, the hometown of Annie, 2Face was asked to raise his right hand to the sky and touch his Joystick. This reportedly took place at the field of Apostolic High School, Esit Urua, where the wedding was held. He was then asked if he still has this joystick intact after he touched it which he answered in the affirmative. The next question was if 2Face will satisfy her, as usual of 2Face, he jokingly answered yes. At this point, laughter filled everywhere. Plastic Surgery On Dakore's Nose?